Mostly in electrical technology students , a question are serve in his minds about the single phase motor that how to identify starting and running winding. Basically when we talk about the single phase motor wiring or installation connection. We always think about the start , run and common wire or terminals. In one phase motor connection we have three wire are coming from the motor winding which are start , run and common. As you know that we have two types of winding in a single phase motor which we known with name of starting and running winding. The running winding also called the main winding while the starting winding is better known with name of "auxiliary winding". The point where these moth winding are connected is called the common point which we know better with name of "common connection of a one phase motor" or "the common terminal of a single phase refrigerator compressor". If you open the single phase motor , you will find out that your motor have two types of winding in which one is made from thick wire gauge and one thin . the thick wire gauge winding is main winding and thin wire gauge winding is starting winding. But this Identification can be done when you open the motor but what you will do if don't want the motor and just want to find out starting and running winding from the main connection plate or connection point. In a single phase motor we have three wires which comes from the both stating and running winding. Which we known with the name of common, start and run connection. To find out the common , start and run wires or connection first read the connection plate diagram and notes to find out which one is common, which one is running and starting. In some one phase motor the the common wire come with black color wire, run as red and start as white color. But this is not important that the connection will come with same colors. Mostly these color are change. So the better and easy option to to find out the run , start and common wire or connection to read the connection plate diagram or chart. And if you did not find any guide about the connection then follow the below step. If you find out that two wire have greater resistance between one another then it's mean that these are start and run and the 3rd one is common. So you identify the common wire , so the next step to find out which one is start and run wire. The method is easy, the resistance between common and staring will greater then the Resistance between common and run wire. So the greater resistance between common and other wire will identify that this is start , starting connection or terminal. So you find out that starting connection. So it's clear the other wire is run connection wire. 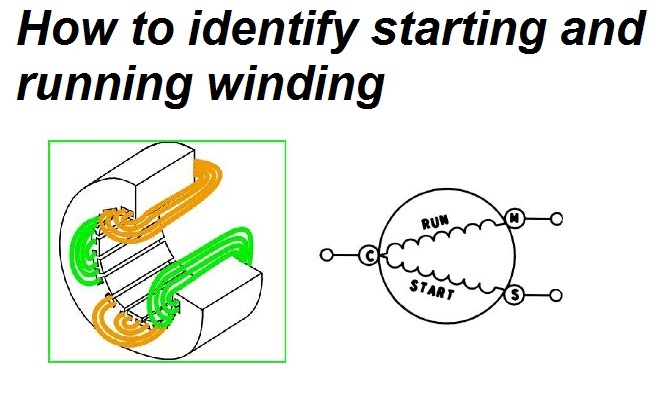 To identifying starting and running winding' i means that you are searching about the staring and running and common identification in a single phase motor. So if you are searching for this then the above method is for you. And if you want to identify the starting and running winding then the easy method to open the motor internally. And see which winding wire greater in size. For example is you find out two winding and one winding are made from 21 SWG and 2nd winding is made from 26 Then 21 SWG is greater in size which running winding or main winding and 26 SWG winding is staring or auxiliary winding. I hope this post help you find out how to identify staring and running winding or identification the start, run and common terminals or connection is a single phase motor. If the post help you then kindly share this post. And if you have any question then you can use the below comment section for asking you question. I will try my best to gave answer of your comments. Hi, if the condenser is in serie with the starting winding, in this case can I mesure the size in ohm ? ?